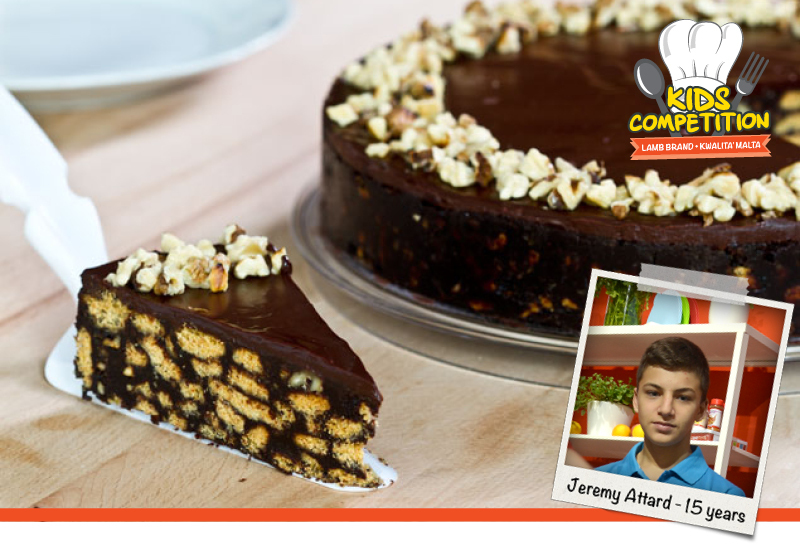 This No-Bake Chocolate Hazelnut Cake is amazing and was prepared by Jeremy Attard, Senior Group winner from the Lamb Brand Kwalita' Malta Kids Competition 2016. 1. In a bowl, roughly crush the digestive biscuits and mix with the chopped hazelnuts. 2. In a separate bowl, combine the butter, chocolate, heavy cream and Nutella. Microwave, stirring every 30 seconds for 2-3 minutes or melt over a double boiler until smooth. 3. Pour the chocolate mixture over the cookie/hazelnut mixture and stir gently to combine. Firmly press the cookie mixture into an 8 inch (20 cm) cake tin lined with foil. 4. Chill for 1-2 hours or until firm. 5. For the glaze, place the chocolate and Nutella spread in a bowl. 6. Bring the heavy cream to a boil in the microwave/in a saucepan and pour over the spread and chocolate. 7. Let the mixture sit for 30 seconds then stir till smooth. 8. Remove the cake from the cake pan and peel off the foil. 9. You can wait till the glaze hardens in order to spread it on top like frosting, or you can pour it over the cake so that it forms a glossy outer coating. 10. Sprinkle the cake with toasted, chopped hazelnuts and digestive biscuits to garnish. 1. Peel the pears and put them in a pan and add all other ingredients. 2. Cook the pears until are softened and the liquid is reduced.